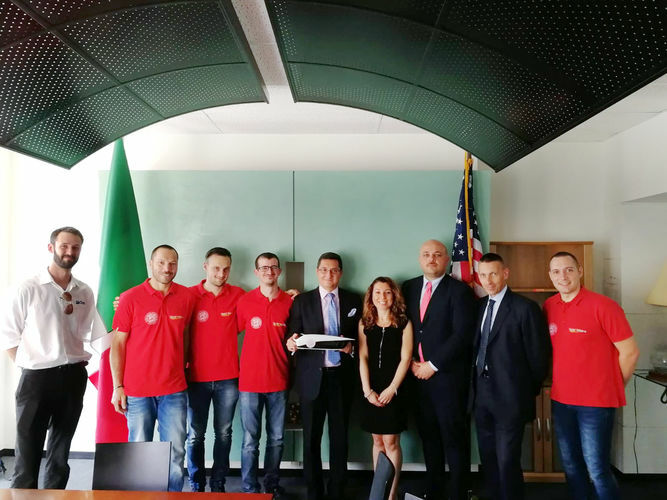 An important recognition by the Italian Consulate in Chicago of the research and innovation efforts and high technological achievements that made possible the participation of such Made-in-Italy products as the “Emilia 4” solar car in tough international races. 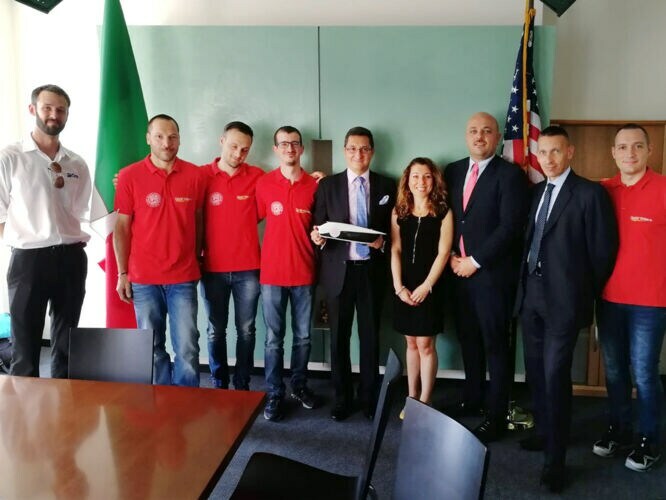 The car, created by the Onda Solare (Solar Wave) team within the University of Bologna, with Scm Group as a principal industrial partner involved in the design and manufacturing phases, has arrived in the United States where it will compete in the American Solar Challenge 2018 (14 to 22 July). Ahead of the great event, where the Italian solar car is to compete against other solar-driven vehicles developed by high-ranking U.S. universities, Italian team members accompanied by Cms North America Marketing Manager, Christopher Nesbit, representing the Scm Group, were greeted by the Consul General of Italy in Chicago, Giuseppe Finocchiaro, on Saturday, June 30th. The reception included a demonstration of the car’s highly-innovative and eco-sustainable features (made using "green" materials and weighing just 300 kg, with energy consumption that equals that of a small hair dryer). A carbon model of the car was presented as gift. The Cms Advanced Materials division, known for its excellence in processing composites and aluminium for the automotive and aerospace industries, among others, has played an important role in machining the moulds for producing the car's carbon-fibre body. In the coming days, the Emilia 4 car will travel from Chicago to Nebraska, to go through the scrutineering portion of the competition. The team will be joined there by another Scm Group representative, Denise Dujmic, who supervised all the car's design and manufacturing operations at the Group Industrial Research Centre. Denise will be part of the racing team, and through her we will follow the entire Emilia 4 American adventure. Stay tuned!